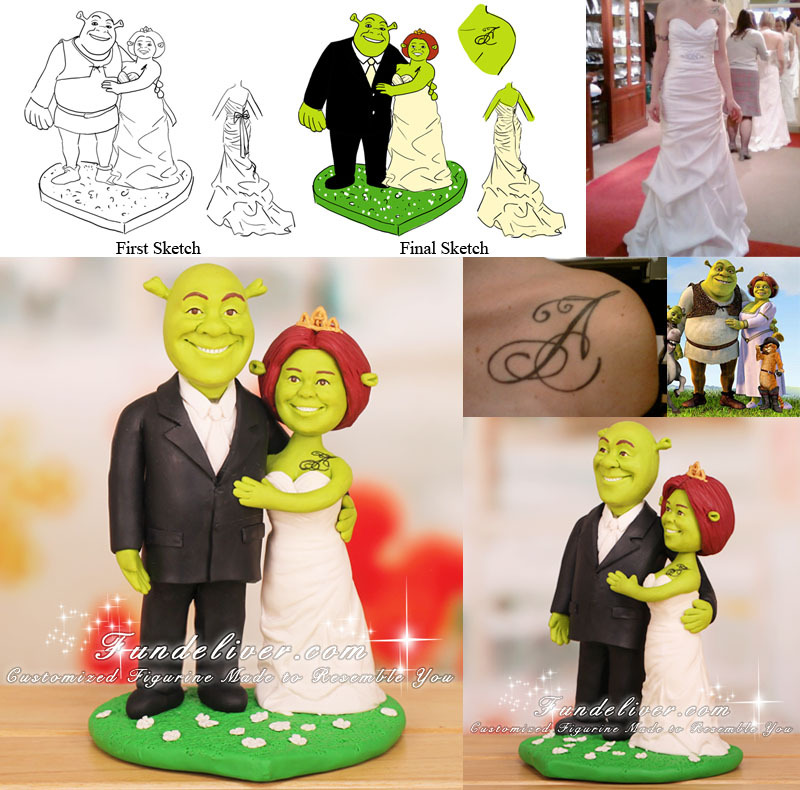 This is a completely customized Shrek and Fiona movie theme wedding cake topper ordered by one of our customers. They aren't having a Shrek themed wedding or anything, but groom's friends nicknamed him Shrek because of their similar look (minus the green haha). So the bride ordered this Shrek and Fiona cake topper. They would like Shrek and Fiona to be in a "traditional" bride and groom pose with Shrek in a tux and Fiona in an ivory satin wedding dress, standing on a heart shaped grass pedestal decorated with small white flowers. They prefer the figurine to look like the movie character as opposed to their faces. The bride would love Fiona to have the same "A" tattoo on her shoulder. Many of our cake toppers have integrated with movie characters, costumes, hobbies, interests and careers. 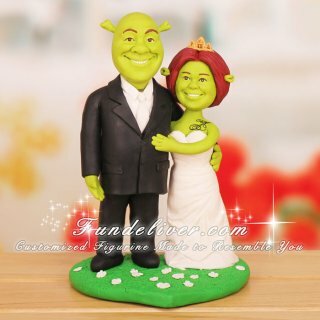 We have a section dedicated to unique movie characters cake toppers like Shrek and Fiona cake toppers, Hellboy cake toppers or any other characters you love. The ideas are endless! Just tell us any kind of comic book or cartoon character you love, we will first design some 2D sketches to get your approval and then turn them into 3D figurine to reflect your hobbies or interests.